Environmental means all those circumstances, which are able to influence the living organisms as well as non-living parts. Environment includes physical, intellectual, social, moral, economic, political and cultural forces, which can singly or jointly influence the activities, behaviour, and personality characteristics of an individual. Industrialization is a process of social and economic change whereby a human group is transformed from a pre-industrial society into an industrial one. It is a part of a wider modernization process, where social change and economic development are closely related with technological innovation, particularly with the development of large-scale energy and metallurgy production. It is the extensive organization of an economy for the purpose of manufacturing. Industrialization also introduces a form of philosophical change where people obtain a different attitude towards their perception of nature. 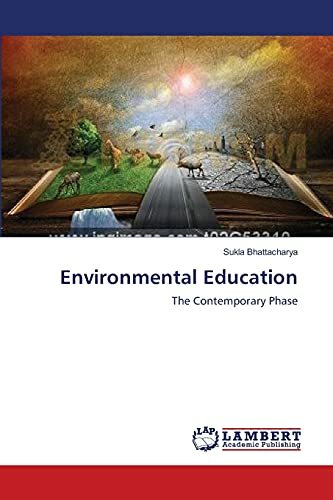 This book highlights on the kaleidoscopic view of Environmental Education to cope the recent degradation phases of our mother Earth. Dr. Sukla Bhattacharya Born and brought up at Santiniketan , at present an Associate Professor of Education in the Department of Education, Vinaya Bhavana, Visva Bharati University, Santiniketan has obtained her Ph.D degree in Chemistry. She has a long teaching experienced in Chemistry as well as in Education.